PVC-U. ED, 080-50-T28 according to DIN EN ISO 1163. Resistance to atmospheric agents (DIN EN 513): Colour alteration not exceeding level 4 on the grey scale DIN EN20105-A03. Used profiles are produced in compliance with normative RAL GZ 716/1 and DINEN12608-1. All main profiles are with constant sections, multi chamber system, equipped with a main chamber for the insertion of metal reinforcements. Sealing system with two seals, one external on the frame, plus an internal seal on the door edge. The doors and frame exchanges are equipped with a special groove for hardware tape installation, positioned with a distance of 13 mm from the inner side of the frame. 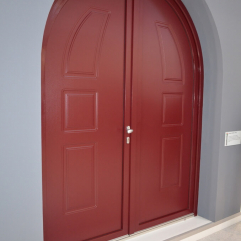 The thickness of the outer walls is in accordance with Directive RAL GZ 716/1 which provides a minimum thickness of 3 mm, with depth of the frame profiles 70 mm and depth of the door profiles 80 mm. Setting of all hardware parts will take place with at least two PVC walls and, if necessary, on steel reinforced parts. Frames, horizontal transoms and doors will be equipped with a collection groove and drain holes for any water penetrating and for deposits of condensation, according directives by 5 x 30 mm staggered holes in more points. Stain Resistance: Resistant to usual agents for home use such as ammonia water, gasoline, alcoholic beverages (<45% vol. of alcohol), non-abrasive detergent, water. Not resistant to organic solvents, thinners and solvents in paint. Under stress the maximum acceptable curvature between the frame and the edge of the plate, calculated between two points, corresponds to 1/300th of the length. If double-glazing are usedthe curvature ofedge’s plate, between the frontal edges, must not exceed 8 mm. Resistance to wind load certified by UNI IIP up to class B3 in accordance with DIN EN 12210. In particular, the fixtures will comply with the rules for calculation of resistance to wind load in compliance to DIN EN 1991-1. For resistance against heavy rain and air permeability fixtures will conform to rulesDIN EN 12207, DIN EN 12208. The fixtures will be made with reference to DIN 4108-2 rule and with reference to Directive for Energy Saving no. 2012/27/UE. Based on criteria for transmittance calculation (DIN EN ISO 10077-1), fixtures have a value of thermal transmittance typical of the leaf node - frame of 1.3 W/m2 K.
All steel reinforcements used will be produced in material type FE-P02-Z-275 NA, treated against rust, with a wall thickness of 1.5 mm. All main profiles will be strengthened with galvanized steel profiles suitable for predictable conditions, and a minimum thickness of 1.5 mm for both white and coated profiles. For entrance doors the reinforcement used will be that of closed tubes welded with a minimum thickness of 3 mm. In order to improve stability, this reinforcement will be welded at the corners with a PVC corner radius. The reinforcement connections of the profiles will be secured with galvanized screws, positioned 30 cm from one another. Installed hardware will comply with DIN 18357 rule and a certification of quality will be provided with. The check documentation refer to the expected stress and to constructive dimensions of manufactured frames. Hinges supports and scissors supports, together with ratchet and closures must be adjustable.The corner support has torun the door safely and must avoid the window comes out from its hinges when the door is open. Scissor of flap door must avoid door comes out of hinges or it will open. Appropriate plastic covers will be used to match the handle in order to cover the elements of visible hardware when the door is closed. 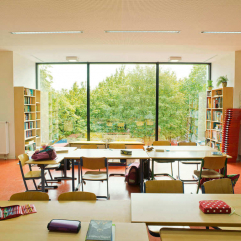 Fixtures are provided with multiple locking points, so that the distance between two consecutive points does not exceed 700 mm. The hardware will have a double anti-corrosion zinc treatment and chrome plating and will have a surface finish in silver color. It will be assembled with screws fixed on at least two walls of PVC or, they’ll be fixed on a PVC wall and on a metal reinforcement. A perimetricallock on 4 sides will be provided as well. For entrance doors the used lock will be automatic with three closure points. At least three heavy anti-breakage hinges will be used with adjustments on XYZ axis. 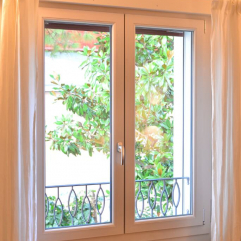 If not expressly required by customer double glazing and double sealing insulation, transparent or frosted will be used. Thickness of glass is 4mm [chamber + Argon] – 33.1 BE black WE for windows with a base having height exceeding 100 cm from the floor; for lower heights and French doors insulatedglass 33.1 [chamber + Argon] - 33.1 BE black WE will be used. The glass depth joint will be 20mm. The bottom of the joint is inclined,with no protrusions and allows a full support of dowels and spacers. The single foot glazing beads will be positioned on the inner side of the casing, cut to size, and assembled so that they snap in place with no sloping between them. The pieces of glazing will have a length of 100 mm and shall be secured so as not to slide. They’ll be made with a non- perishable material when in touch with butyl. Panels’assemblage is standard with appropriate glazing beads. Glazing beads will be suitably dimensioned according to glass thickness. 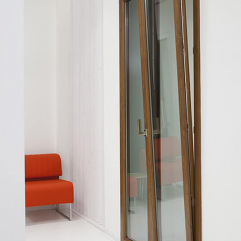 At our factory near Pesaro, we produce around 300 windows and doors every day. 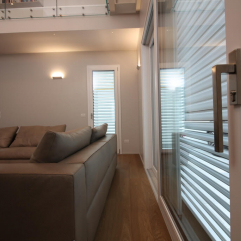 From simple windows to complex sliding systems, arched windows and all the necessary complementary products and accessories, such as shutters or rolling shutter casings. Our doors and windows are built by our most skilled craftsmen using high-tech machinery, guaranteeing a perfect blend of tradition and innovation.